Beyond the camera and lens, the most important technical and creative skill you can have is learning to use and shape light. A good place to start is knowing the tools you have at your disposal. Before we get into the types of film lights, let’s take a quick look at the two most common types of fixtures. An open faced lighting fixture is used to create hard light that casts hard shadows. It is not much more than a housing and reflector for the bulb, and provides nothing in between the bulb and the subject. 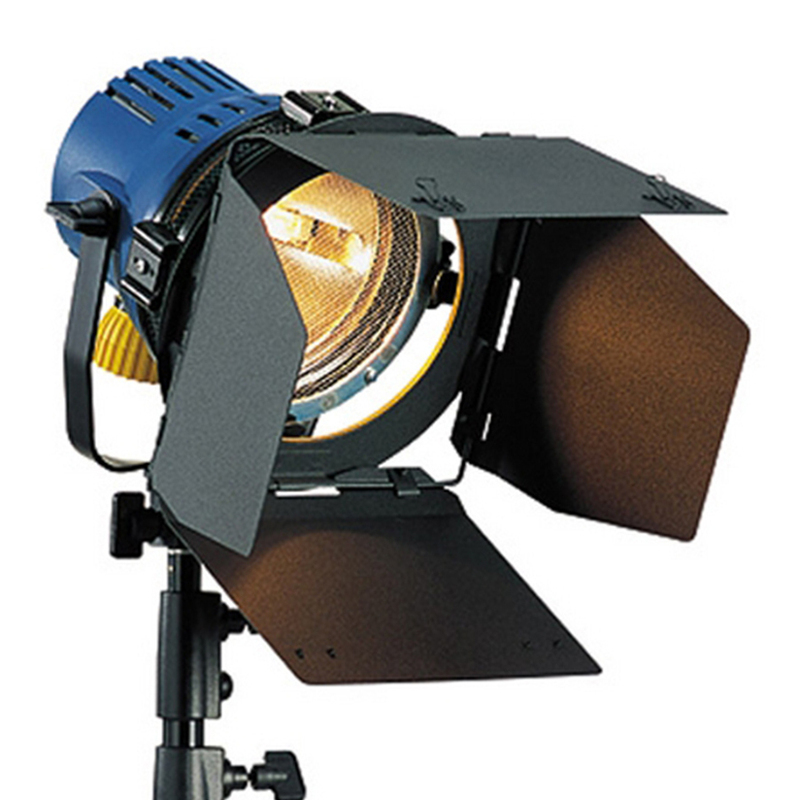 The commonly known 800W “Redhead” and 2000W “Blonde” are examples of open faced video lights. A Fresnel lens is a special type of lens that is divided into concentric circles, resulting in a much thinner lens than a conventional lens of the same power. This lens evens out the light and allows for the beam to be varied from flood to spot by changing the distance between the lamp/reflector unit and the lens. A practical light is considered any light source that will appear in the scene such as a table lamp, any visible interior light sources, even a hand held flashlight. Often existing bulbs are swapped out for those of different wattage or color temperature depending on the needed effect and desired contrast ratios within the scene. CRI stands for Color Rendering Index. It refers to the ability of a light source to properly and faithfully reveal the color of an object compared to an ideal or natural light source. The highest possible CRI is 100 and is attributed to a perfect black body (a tungsten light source is a perfect black body, as is the sun). Color temperature refers to the “color” of white light emitted by a light source based on that radiated by a perfect black body at a given temperature measured in degrees Kelvin. White light can be warm (yellow/orange) or cool (blue) and our eyes automatically adjust. 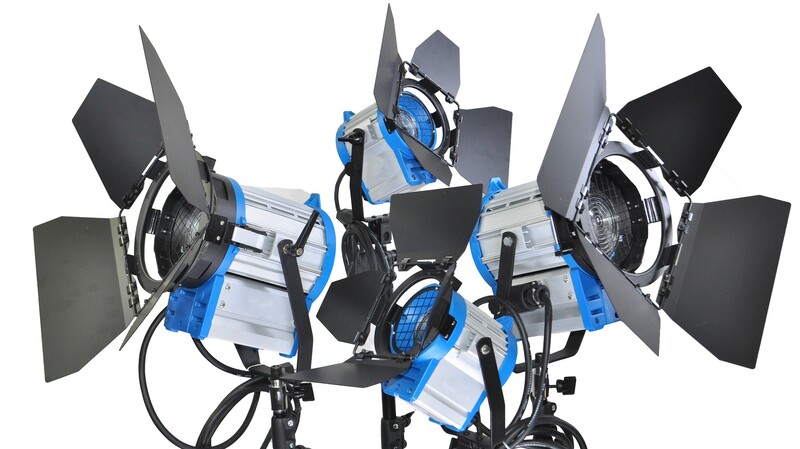 However, the color temperature of light sources and especially the mixing of different color temperatures becomes very important when designing film lighting. Tungsten light sources are basically related to the same type of incandescent filament bulbs which until recently were common in homes and offices everywhere. The key difference is that these use bulbs that take advantage of what is known as the halogen cycle. The pressurized halogen gas inside the bulb helps to redeposit evaporated tungsten metal back onto the filament. The glass bulb is made from a much stronger quartz or aluminosilicate glass. The lamps operate at a higher temperature than normal incandescent tungsten bulbs, and so they can achieve a higher color temperature, and higher luminous efficiency. They naturally produce a warm light, but blue color correction gels can be used to simulate daylight. 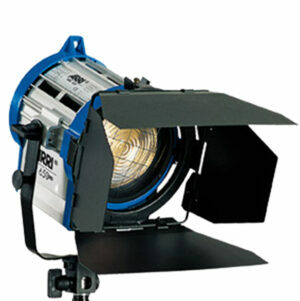 Tungsten lighting fixtures can be open faced or Fresnel up to about 20kW in power and are dimmable. They produce a continuous spectrum of light from near ultraviolet to infrared, producing near perfect color rendition. 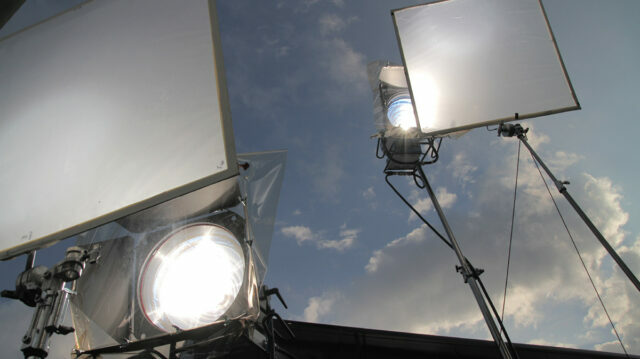 When dimmed tungsten lights become warmer in color, so gels are needed to correct the color temperature. Tungsten lighting is usually used to light interiors as it matches the warm light associated with domestic incandescent lighting. The bulb is capable of blowing and sending hot glass shards outward. A screen or layer of glass on the outside of the lamp can protect users. HMI stands for Hydrargyrum medium-arc iodide and is a metal-halide gas discharge medium arc-length lamp. A HMI bulb contains mercury vapor mixed with metal halides. An electrical arc between two electrodes excites the mercury vapor and metal halides resulting in a very high light output and luminous efficiency. HMI lamps are capable of between 85 and 108 lumens per watt, up to four times that of conventional incandescent lamps. The specific mix of gases in a HMI bulb is designed to emit a 6000K color temperature light, closely matching natural sunlight. Electronic ballasts produce a flicker free light due to their very high frequency operation. Pulse width modulation can be used to dim HMI lights. HMI’s are often used when high output is required and when recreating or augmenting sunlight shining into interiors, or for exterior lighting. Powerful HMI’s can be used to light large areas. A fluorescent lamp uses the excitement of low pressure mercury vapor to produce ultra-violet light, in turn causing a phosphor coating on the inside of the glass tube to glow giving off light in the visible spectrum. A fluorescent light is much more efficient than an incandescent light, and is capable of generating up to 100 lumens per watt, similar to the output of HMI. The spectrum of light emitted is different to an incandescent source and depends on the mix of phosphors used. However a CRI up to 99 can be achieved. The color temperature of a fluorescent can vary also from 2700K to 6500K depending on the phosphor mix. Fluorescent film lighting is most often used in fixtures containing banks of tubes. These tubes are normally either tungsten or daylight color balanced, or the tubes can be mixed within the fixture to vary the overall color mix of the light. They produce a soft and even light and can be used in relative close proximity to the subject. Fluorescent lighting is often used to light interiors and has the advantage of being more compact and cooler in operation than tungsten or HMI lighting. Flicker can be a problem with domestic fluorescent installations not intended for photographic use. 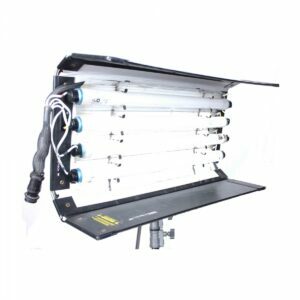 Those designed for film use have electronic ballasts and produce flicker free light. Fluorescent lights for film use have a high CRI, however the use of domestic tubes may have a far lower CRI and poor color rendition. LED stands for light emitting diode and is a solid-state semiconductor device. Only recently, LED’s of sufficient power have become available to make practical LED film lighting possible. LED’s are extremely efficient but are still limited in overall light output when compared to any of the other light sources. 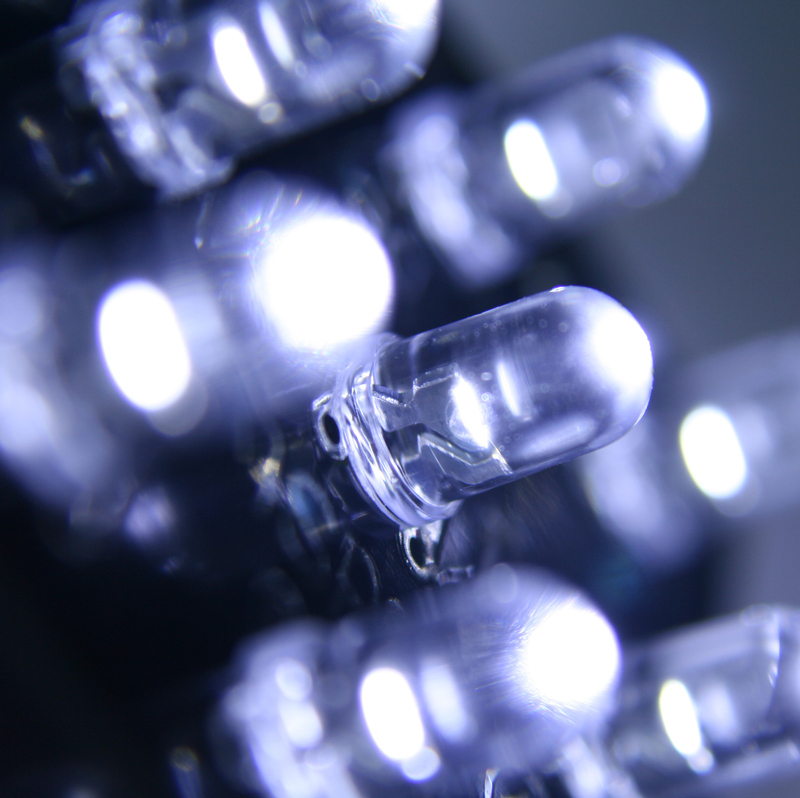 LED’s are by nature monochromatic, producing only a single wavelength of light. So the challenge of LED lighting has been in creating a full spectrum white light. This can be done in two ways, either by combining the light of red, green and blue emitting LED’s, or with white LED’s whereby the visible white light is actually created by phosphors that are excited by an ultra-violet emitting LED. LED lights can be daylight or tungsten balanced, sometimes switchable or having variable color temperature. Some have variable color through the entire RGB spectrum, which is something not possible with any other lighting technology. The CRI rating of LED lighting can be over 90. 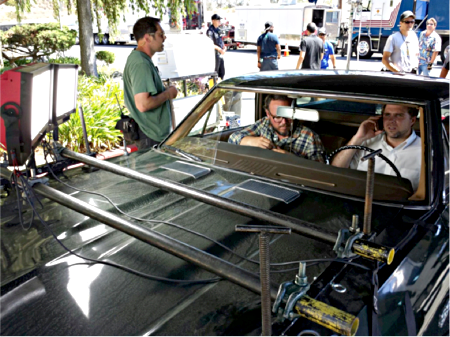 LED’s are becoming more and more common on film sets. 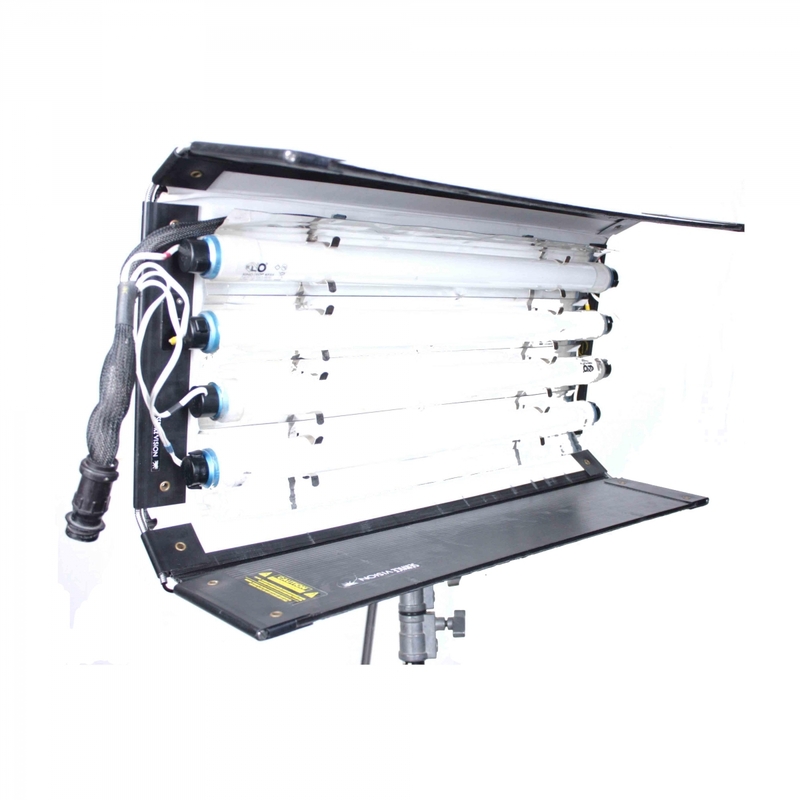 They can easily be battery powered making them very portable and requiring no separate ballasts or heavy cabling. Panels made from LED lights can be small and compact, or large for a variety of situations. LED’s are also powering more traditional Fresnel style lamp heads such as the Arri L-series. Overall power outputs are on the rise, which is good news. High cost. 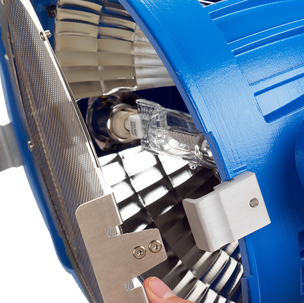 LED’s are currently still expensive for their total light output. When all is said and done, all of these lights have a specific purpose, and you’re likely to see them all on any film set. Not one of these lights can be used for every purpose and any lighting kit list would be severely compromised if any of these were missing. Big HMI’s are going nowhere. When you need to manufacture sunlight, the only way to do it is with big power hungry HMI’s. There is simply no other way to generate that amount of light. Yes, this means generator trucks and added crew, but when it comes to lighting big exteriors none of this is about to change. Even on a conservative job I would suggest having a 2K and 5K HMI available. Tungsten light is cheap and is still the workhorse of interior lighting. 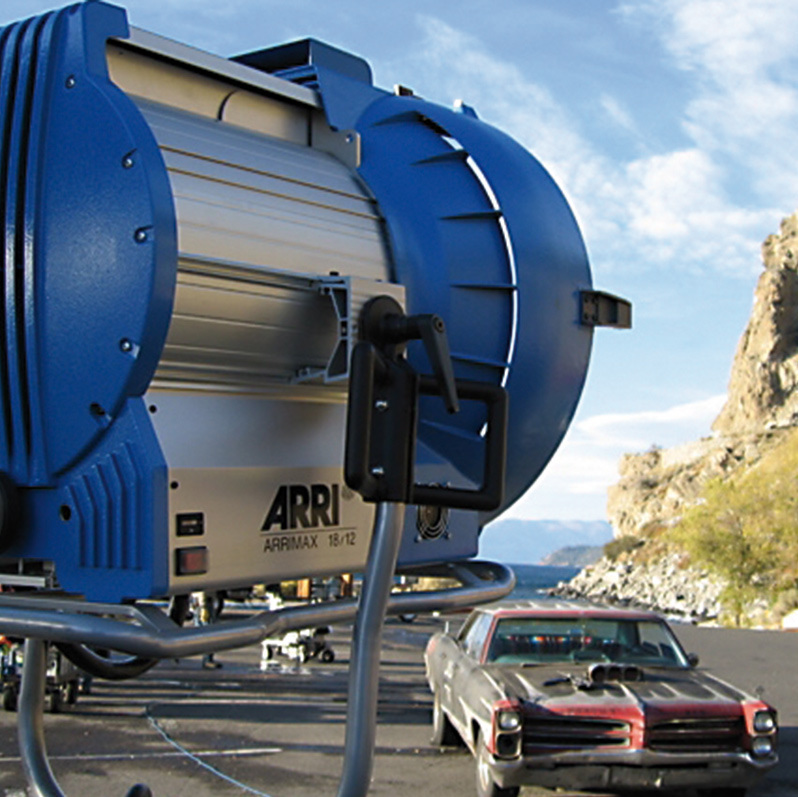 LED Fresnel technology may at some point reach a practical equivalence but even with Arri’s most powerful L-series, it’s not going to replace the medium to high output Tungsten lamp heads soon. LED’s are also a permanent addition to the lighting department. 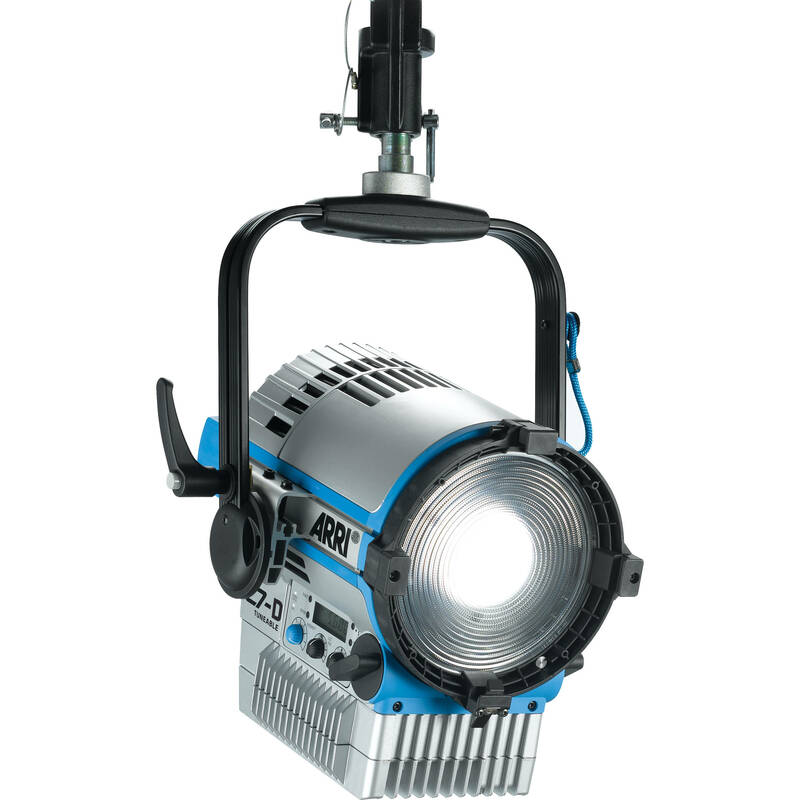 For space restricted setups and the sheer portability that battery power affords these lights have become indispensible. Fluorescents provide a lovely soft even light. They offer higher output than LED panels and can be larger in size, although LED panels can of course be tiled. Fluorescents are also very cost effective. That covers the most common types of film lighting, but it is only the beginning of the story. Creating light is one thing, but shaping and controlling it is the most important skill of all to learn.